Download the My Course Is Full overview sheet to view a larger version and print. There are a couple of ways to deal with full classes, and which one is applicable depends on the particular course. Online waitlists: Some courses have waitlists. That means you can register for the waitlist in the SSC and the department will move people into classes as spaces become available. These waitlists look like sections, but they will say “waitlist”. Note: registering for a waitlist will take up credits. You will not be notified that you have been moved from the waitlist into the course so regularly check your timetable in the SSC. Informal waitlists: Some instructors have informal waitlists. During the summer and in the first weeks of class, they may sign Change of Registration Forms for students on their waitlists or who come to class and request it. Not all instructors do this, but it doesn’t hurt to ask. Sometimes, it is not possible to get into a full course: For some courses, such as Economics, instructors are not able to add students to their full classes. Check the course schedule regularly: You’ll be surprised at how many people make changes to their schedule all summer, and if someone drops a course while you’re on the system, you can enter it that way. Try to find another class: Try using the Course Search function on the UBC Course Schedule to find another suitable course if you cannot get into the one you want. What if the tutorial, lab or discussion group is full? Sometimes, there will be room in the class but the tutorial (lab or discussion group) is full. If this is the case, keep your seat in the class and continue checking to see if a seat opens in one of the associated tutorial sections. If they all remain full, speak to the professor on the first day of class and request a seat in the tutorial. Please note – if any seat opens that does not conflict with your schedule, you should take it. Do not wait for a seat to open in your preferred timeslot. Tutorials are small and you will need to be flexible. If you’re in your graduating year, you will not be excluded from taking a required course due to space. This rule does not apply to electives or preferred sections. 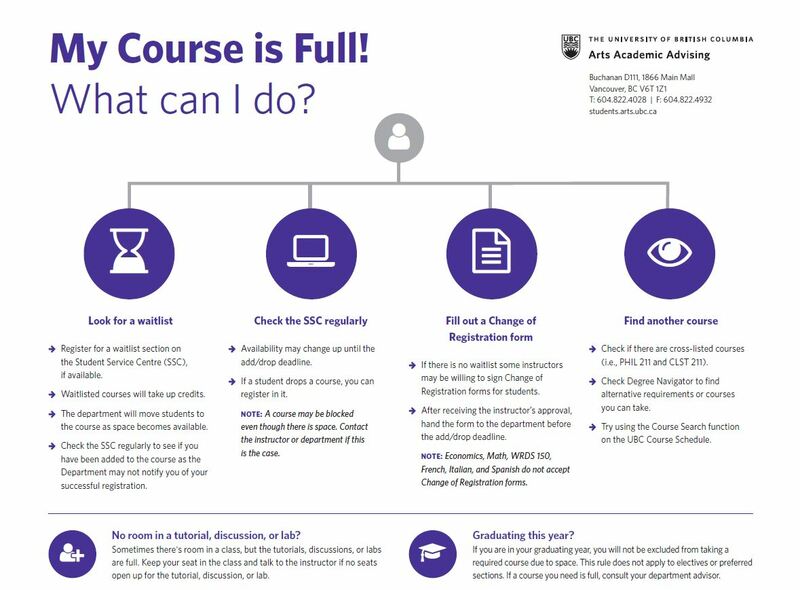 If a course you need is full, consult your department advisor.